This morning, we woke up to a sneak preview of winter! I thought I had forgotten to flip a page on the calendar and it was late November instead of late October. Although this is a sight that I don't look forward to, you can see that Tess and Jazz had fun in the snow this morning while it lasted. 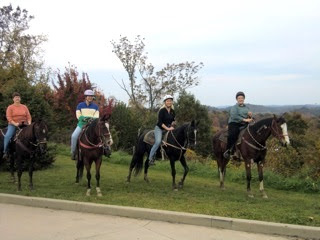 Yesterday I had the pleasure of sharing my love for riding horses with some of my friends. LaDonna, Cindy, and Donna joined me and my Victory Stables riding companion Lynn and Victory Stables owner Sandy for a trail ride on a spectacular fall afternoon. Donna has just started taking lessons at Victory and Cindy is about to start taking lessons! LaDonna hasn't ridden in quite a while, but she had a wonderful time and says she'll come out again with us sometime. From left to right in the photo above, it's me on Corey, Cindy on Matthew, Donna on Dianah, and LaDonna on Harley. Ride 'em, cowgirls!! It seems that in the past month, Jazz has really come into her own. It started with the Splash 'n Dash USDAA agility trial in late September. Jazz qualified in six of her seven runs that weekend! We were especially proud of her, because we feel USDAA is the toughest competition venue in agility. Tess had an unusually rough weekend, but she still managed a couple qualifying runs in very tough Performance III competition. The first weekend of October, both girls showed with me at the Westmoreland County Obedience Training Club's Rally and Obedience trial. On Friday, Jazz earned her sixth Rally Advanced Excellent (RAE) leg. She needs 10 qualifiers to earn her RAE title. Tess completed her very first Rally Excellent leg with a very nice second place finish. The girls then went on to earn first place in Rally Advanced Pairs, where both dogs do the Rally course together. We always do well in Pairs, and I think Tess and Jazz like being out there together. On Saturday, Tess and I stepped into the obedience ring for the very first time together, and she got her first Beginner Novice leg with a third place finish. Tess went on to be High Scoring Dalmatian in the trial, as well as High Scoring Non-Sporting Dog. Not a bad start! Jazz completed the third leg of Novice obedience competition, thus earning her Companion Dog title. She had the best run ever with some very nice off-leash heeling, and it ended up being a first place finish to top off her title. Way to go, Jazz! This past weekend, we were once again at USDAA agility, this time at K9 Four Seasons Athlete Center in OH. Jazz had another great weekend, qualifying and placing in five out of eight runs and earning her Performance I Jumpers and Performance I Gamblers titles. Tess had a better weekend, earning four qualifying scores in Performance III competition. Way to go, girls! You may wonder why we compete for so many titles. While it's nice to get all the pretty ribbons, it's really not about the titles at all. It's about the joy of being in the ring with our dogs and reaping the rewards of the training we do with them. A title merely lets the world in on what we already know: We love our dogs and they are awesome! I cannot begin to describe the special bond and relationship we have with our dogs through training and competition. The teamwork between us is one of the most rewarding things I have ever experienced. It is such a pleasure and so relaxing to train, travel, and compete with these two Dals. We've made lots of friends in every venue and almost always stop for dinner with a group of folks after the competition, so there's a social element as well. Our dogs are content and well behaved because we spend time with them and give them something to do. I think they enjoy it every bit as much as we do. Just the level of communication alone is worth the effort. I know many of you who follow our blog train and compete with your dogs, too, so you know what I'm talking about. If you want a happy, well-behaved dog, I'd encourage you to develop a bond and mutual respect through training. Your dog will love you for it!